I took this a couple of weeks ago while hanging out at the MCC office in Beira. Also, I moved into a new house last week. The house is nice, but we've had plumbing issues so I woke up to a flooded hall the first night and lacked water to bathe properly on subsequent nights. Rough. 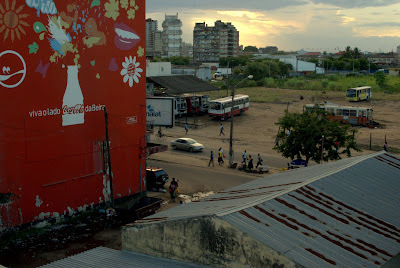 Nice inclusion of the Coke building advertisement. Hope you are doing well...seeing the political turmoil in northern Africa is pretty unsettling. I'm fine...but JAPAN!!! Holy smokes I saw some videos and I couldn't believe my eyes.